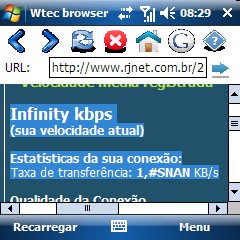 A simple and fast browser for your Pocket PC This is the first beta of the browser, so do not hesitate to ask or criticize, to improve the application, this application is freeware and opensource anything send me an email to jonniv2@aol.com. this browser is based on 6.0 poket ie, interface with large buttons and interface improvements facilitated the browsing experience, but is good at 240x320 on 240x240 is a bit small, supports Flash (with appropriate plugin installed) and downloads. Do not hesitate to send emails with doubts Requires Compact Framework 3.5 Enter "http://" before the sites get no errors while browsing, it is necessary during this beta I wish I got a comment on the application. Requires Compact Framework 3.5, minimum screen size: 240x240, 240x320, 320x240. Hmm...nice post. Thanks for your sharing.